Backpackers.com — Winter hiking is often for the brave. It can involve snowshoes, four full layers of protection, special tents, and a certain sort of fortitude. But it doesn’t have to be so intense. There are plenty of places in the U.S. that have wonderful wintry trails for the average hiker. We spent the winter of 2016 highlighting some great trails for you. We know, we know, spring is technically here. But the snow has yet to melt in many places. And, for the dedicated, this is a great guide to get started on next year. Or to scope out these spots in the warmer months to better prepare for a colder trek. Below you’ll find a roundup of 10 epic winter hikes, each with a short description. Click on the link for our full article on each hike. Marble Falls Trail is a moderate hike in Sequoia National Park. It’s an out and back trail (not a loop) that begins at the Potwisha Campground, and is four miles one way, eight in total. It’s uphill the whole way, which means downhill the whole way back. You’ll gain 2,400 feet during the hike — so bring water and food and get ready to shed those winter layers. Waterfalls at the end, and a gorgeous view throughout. The Sand Bench Trail is a short, 3.4 mile loop in Zion National Park. In summer it’s a horse trail — and a rather hot hike. But in winter the tours are shut down, which leaves a quiet, chill trail to explore some of the lesser known sights in Zion. You gain and lose just 400 feet in elevation during this trip, and if you’re lucky a light dusting of snow will rest on the red rocks and monstrous stone peaks. This one is more of a general guide to winter hiking in the Grand Canyon than a specific trail. This really is one of the most majestic places on Earth, and it is absolutely hike-able during the coldest months. This is also the least busy time of year for the Grand Canyon, which can get packed during spring, summer, and fall. Three trails are highlighted: Clear Creek Trail, Tanner Trail, and South Kaibab Trail. All of this is explored in a helpful video by Kurt Papke. Hiking the South Ridge Trail in Acadia National Park is a solid winter excursion in Maine, close to the small sea town of Bar Harbor. A 3.5 mile hike climbs 1,350 feet to the summit of Cadillac Mountain, the highest point along the North Atlantic Seaboard. An amazing overlook of the Atlantic and surrounding islands will be your reward, and then the cold hike down. Be sure to check the weather, load up on water and food, and bring crampons, Yak Trax, or snowshoes if necessary. And get ready to be one with nature, because few folk will be on this path with you. The South Rim Loop trail in Big Bend National Park is an epic, 12-14.5 mile hike in the rugged landscape of southwest Texas. It’s not so wintry, due to the southern location, but it can be freezing at times. There are many hikes in Big Bend, but we selected this one for its unique and breathtaking views. Also, the difficulty. It’s not an easy hike. It ascends roughly 2,000 feet, and will take all day. There are various points to backcountry camp, if that’s your style. Cloudland Canyon State Park is in the northwestern corner of Georgia, just across the borders of Tennessee and Alabama. Very reachable, it’s a stunning park with a host of trails that are hike-worthy in winter (not to mention all the other seasons). The longest official hike in the park is the West Rim Loop, a 4.8 mile trek that walks along the canyon edge and provides great views. You can also combine a couple trails, like the West Rim Loop and a few others, to see waterfalls. The Bear Mountain Trail in Sedona, Arizona is an uphill barge. You will ascend 2,000 tough feet in 2.5 miles. Parts are steep, and serious, and it will take a good deal of effort to reach the top. 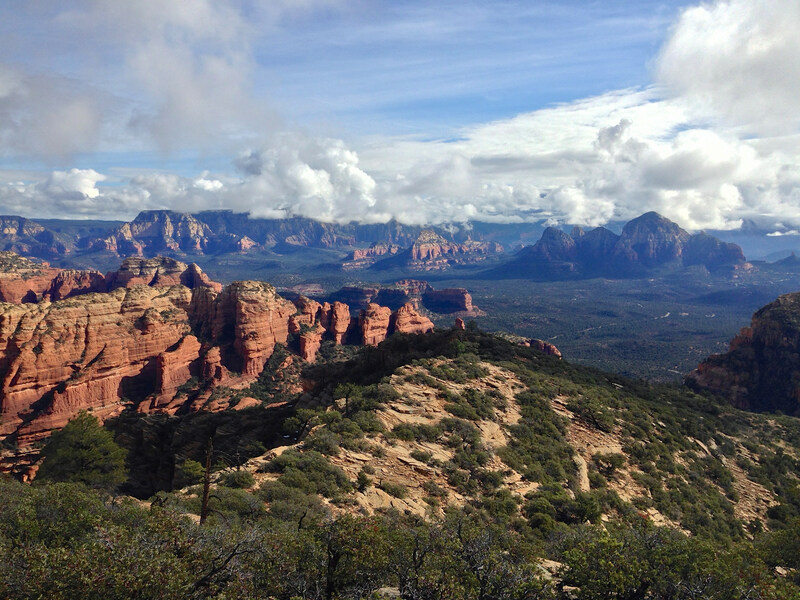 Once there, you will be afforded incredible views of the classic red rocks of Sedona. Check the weather before going, bring snow tools if necessary, and heaps of water. The above picture is of the 2016 superbloom in Death Valley National Park, which the Desolation Canyon hike is near. If you get out there in time you might be able to see this. If not, just go on the awesome hike, which is a slot canyon in the desert. Winter is a great time of year for this hike — it will be way too hot most other times of the year. The hike itself is a moderate 3.6 miles into the canyon, up to the top for a nice view, and back out. Not too strenuous, which will be good for exploring other sites in the area, like Badwater Basin, the lowest point in the continental U.S. Parts of this canyon are where scenes from “Star Wars” were shot — it has that unique Tatooine feel, which most people will love. Summit Lake lies in the Clearwater Wilderness, which is in the North Cascades, near Mount Rainier National Park. The hike to Summit Lake is just 2.5 miles, mostly uphill. That means a 5 mile out and back trip. You’ll gain 1,200 feet quickly, so bring water and be prepared for a climb. This is a popular hike most times of year, especially because it’s only 70 miles from Seattle. In winter, it will be much less traveled. You’ll need snow gear, but the promise of a pristine lake and glorious peaks of the surrounding mountains — Rainier included — makes it all worth it. You can take your dogs, and there are plenty of backcountry camp sites around the lake for the brave. Pinnacles National Park is remote, unique, and breathtaking. This 5-6 mile hike takes you through a good section of the rugged wilderness. It’s a loop, and we recommend starting out on the Condor Gulch trail, gaining 1,065 feet over the first 1.7 miles. Once your heart rate is up, continue until you hit the High Peaks Trail, and take that in a large loop with stunning views and some excellent (a.k.a. narrow) trails. You have an option at the end of the hike to see the Bear Gulch Reservoir and trek through the Bear Gulch Cave Trail — a short jaunt through a tunnel cave that can include a wade through water. It’s worth it. Winter is the perfect time of year for this hike as Pinnacles gets scorching in summer. There are countless hikes in the U.S., even in winter. These are just 10 of our favorite. We’ll be sure to highlight another batch next winter. For now enjoy, these epic winter hikes, and be sure to read the full articles if you plan on going.